The Archives Centre covering the past 50 years history of Wesly Church was officially opened and dedicated to the Lord on 4 May 2008 at 6:30pm after the evening service. This Archives Centre embodies the obligation of each generation to identify and affirm its historical identity and belonging, to impart its treasures of wisdom and knowledge and history to the generation following. As Wesley Methodist Church celebrated its 50th anniversary, all 7 former missionary-pastors accompanied by their spouses together with a few other missionary-teachers came back to join this joyous occasion. All came except for one – Rev. Roy Aylott – who has gone home to be with the Lord earlier. I could not understand why these missionaries in their 70s and 80s would travel all the way from UK or USA to join this event. I wondered, there has to be something “magical” about Sarawak. I just did not get it until I talked to them…. Jackie Fries or Miss Fries (affectionately called by her former students even to this day) used to teach Physics, Maths, Religion and Bible Knowledge at Methodist Secondary School, Sibu, from 1964-1971. While having a very “heavy” high tea in Judy’s house, Connection caught up with her to ask a few questions. Connection: What made you want to come to Sarawak to teach? Fries: I was at that time a Mathematician working with a research group. I figured life must be more than just developing missile projects and doing research. So I applied to the Methodist Mission Board. It was a tough process. We had to go through lots of screening. I passed all and they told me Sarawak need-ed a Mathema-tics teacher, so I went. I spent 10 months learning Chinese in KL before coming to Sibu. Connection: How was life and what were the students like back then? Fries: I lived next to the school compound. I tried to spend some leisure time with the students like playing basketball with them. I found great joy in teaching them. Connection: Have you been back since you left? Fries: Yes, I returned for the class 1971 reunion in 1999. The students were very kind to invite their teachers back. Even then, Sibu was very different already. Connection: What do you do now in your hometown Maryland? Fries: I still tutor Maths occasionally. I serve 3 mornings a week in the security department. I am an amateur radio service operator. I obtained a flying license and I do civil air patrol. I love to take challenges. Connection: What impressed you most when you came back this time? Fries: I am very pleased to find out that some of the students I met are doing very well and accomplished. Connection: Most missionaries stayed here only for 2 or 3 years. You stayed more than 6 years. When you look back, what did Sarawak do to you? Fries: It changed my life. I began to have a new appreciation of life. The students were great and just the thought of being able to give a little input in their young lives is very worthwhile. My friends in USA made comments that I left my heart in Sibu. I think it is true. Sibu is where my heart is. I found it difficult to share with someone who has not been to this part of the world. They just could not understand. When our plane landed at Kuching when we came, Sandy Berg (another missionary-teacher) and I turned to each other and said, “Home again!” That is exactly how I felt. 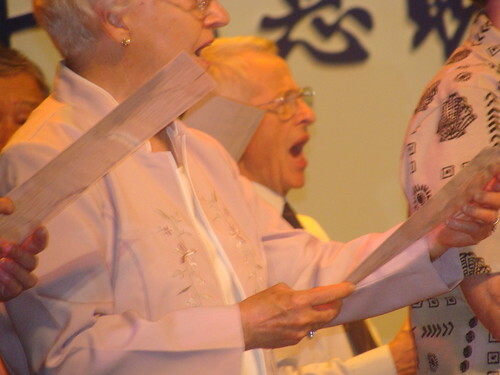 Praise Night was held on 3 May in order to give thanks to God for all the blessings of the past 50 years. Wesleyans were joined by missionaries and pastors from the past to praise God. Rev. David MacDonald, the first pastor of Wesley Methodist Church (WMC), shared about how he came to write the Anniversary Hymn. He had prayed to God, wanting to do something for Wesley’s celebration. 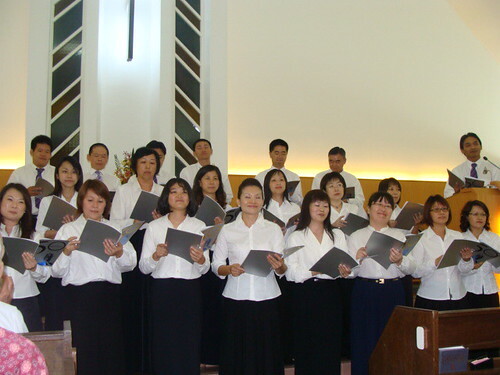 God gave him the words for the hymn, which was sung loudly and majestically by the entire congregation on Praise Night. Missionaries Stephen and Jennifer Yeo also shared about their experience in Phnom Penh. They stressed the need for more experienced teachers to come and help teach English in the Methodist School of Cambodia. Despite rising petrol prices, the Yeos were able to reach out to the non-Christian students. Jennifer Yeo also shared on behalf of Rev. 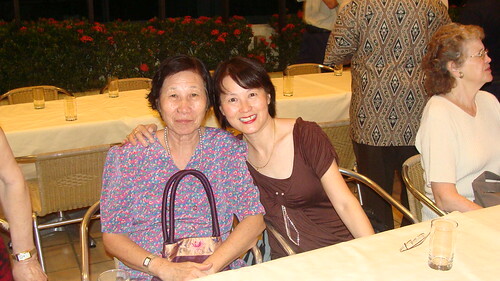 Lenita Tiong, who was unable to make it on that night. Rev. Lenita, who is currently in Miri, has become the bridge to bringing local people to Cambodia. Some of the former missionaries also went up to the pulpit to share. Rev. 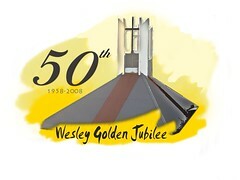 Geoffrey Senior, the second pastor of WMC, said that his old home used to be where Wesley’s sanctuary is standing now. Indeed he felt it was “homecoming”. Rev. Jim Hipkins said that it was great to see the young people gathered to worship God. Ray Sisson, who was a missionary kid at Wesley years ago, told about how Wesley impacted his life as he grew up in its fellowship groups. Rev. Jim Brinks, who arrived in 1969, said that the first time they set foot in Sibu, they thought they had reached heaven. He regards the years in Sibu as the highlight of his life and was thrilled to be introduced to all the outreach pro-grammes during the past few days. 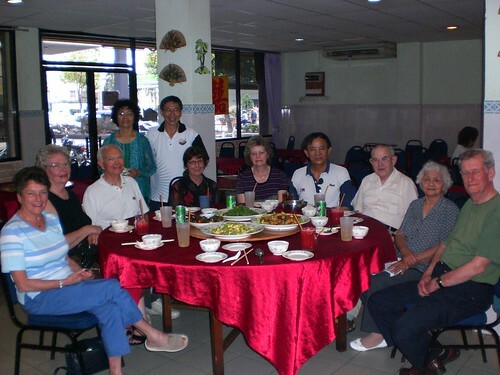 Jackie Fries, former teacher of Methodist Secondary School, shared that she had always left her heart in Sibu, while Shirley Ling said that while Sibu is a small place, its people are big in heart. Bishop Rev. Dr. Hwa Yung preached the message, “To Spread Scriptural Holiness over the Land” during the evening service of Wesley Methodist Church on 4 May. In his sermon, the bishop said that holiness is a theme that runs through the entire Bible. The root word of “holy” means “different”. Therefore, holiness is to be different in a positive way. During the first few centuries, people saw that Christians were different with changed lives and love for others. Can Christianity, when effectively proclaimed and properly practiced, bring about social change? It is possible, as a top social science think tank in China admits that the heart of the country’s success is Christianity. Why did God put the Methodist church in this country? The bishop emphasized that this was a question we needed to ask ourselves. The church has done much over the past years, contributing in areas such as schools and social outreach. Despite that, there is still much to be done as tremendous opportunities open up everyday. Some may wonder what we can do, as we are small in number. The bishop, however, reminded us that it is not the number; it is the quality of life that counts. According to a leading sociologist, if 2% of people begin to live differently, an entire culture can be changed. If we want to cause change, we must put our household in order and correct our life. We say government officials are corrupt. Are we, too, corrupted? Do we truly love our neighbours, eg. Malays and Bumiputras, and treat them as equals? On the night of 3 May, Wesley Methodist Church (WMC), Sibu, held a grand Thanksgiving Dinner in conjunction with its 50th Anniversary Golden Jubilee celebration. There were altogether 110 tables in Dewan Suarah, 34 of which were held by the Boys’ Brigade. Among those present were Bishop Rev. 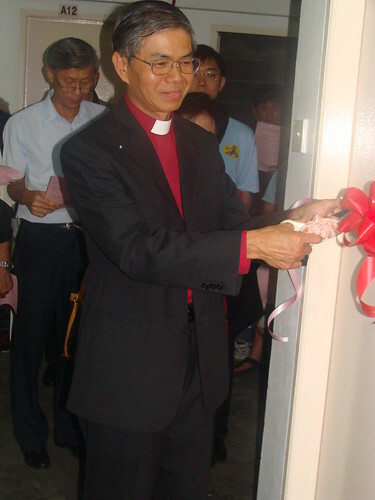 Dr. Hwa Yung, President Rev. 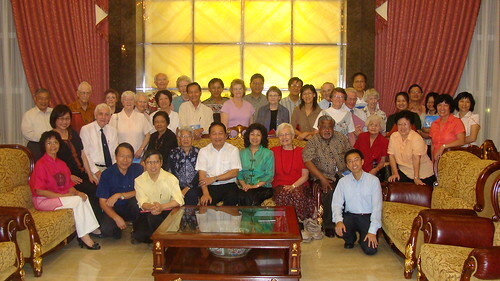 Dr. Su Chii Ann, former missionaries and pastors, and guests from Wesley’s adopted longhouses. Pastor-in-charge of WMC, Rev. Dr. Tiong Chung Tiing, said that the thanksgiving dinner was like a foretaste of the future heavenly banquet. President Su, on the other hand, acknowledged the leadership of the Wesleyans and praised the Wesleyans as good people. The bishop, in his dinner speech, said that in the past, the age of 50 was considered to be a time of retirement. And now, 50 should be a time of being truly effective and a meaningful time. He encouraged the Wesleyans to continue to strive and labour in God as the work will not be in vain. Highlight of the night was a hymn presentation from all the former missionaries and the honoured guests. It was a sacred moment. 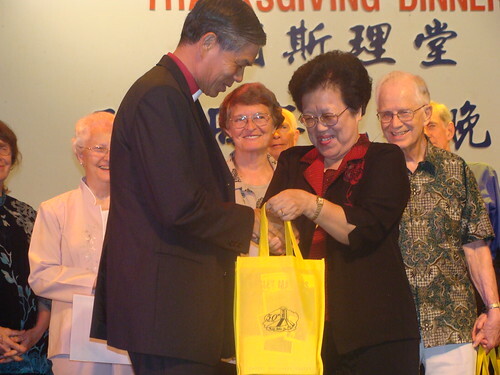 SIBU: Bishop of Methodist Churches in Malaysia Reverend Dr Hwa Yung has called on all parishioners of the Wesley Methodist Church Sibu to continue to be forward-looking, faithful and compassionate as they celebrate their golden jubilee this year. Rev Hwa made the remark when he spoke at the 50th Anniversary Thanksgiving Dinner of Wesley Methodist Church Sibu held in conjunction with the Golden Jubilee celebration of Wesley Methodist Church (1958 – 2008 ) at the civic centre here last Saturday. The theme of the celebration was ‘To God be the Glory’. In her welcoming speech, organising chairperson of the celebration who is also the principal of Methodist Pilley Institute here, Judy Wong said the dinner and celebration was also a homecoming ceremony as many of the church’s former missionaries, former pastors and former Wesleyans had returned from abroad and other places in the country to mark the one-week event from April 30 to May 4. “Four of them are former missionaries from the UK, and three from the US, who are here together with their spouses. They are such a fun group. “Their laughter, enthusiasm, humour, their love for life and for God, being so sporting, has lifted our spirit and made many of us feel young again,” Wong said as she introduced each one to the audience. Also present at the dinner were 15 representatives from four nearby Iban longhouses that Wesley Methodist Church has adopted. The past pastors from overseas were Rev David MacDonald and wife, Rev Geoffrey Senior and wife, Rev Philip Williams and wife, Rev Chris Tomlinson and wife, Rev Jim Hopkins and wife, Rev Jim Brinks and wife, and Rev Lionel Muthiah and wife. The president of Sarawak Chinese Annual Conference (SCAC) Rev Dr Su Chii Ann, Bishop Emeritus Datuk Dr Peter Chio, SCAC secretary general Ting Kong Siin, lay leaders Hii Ching Chiong and Chang Jih-Ren, Rev Kong Chong Ling and wife, Pastor-in-charge Rev Dr Tiong Chung Tiing, and past missionaries – John Vas and wife Sandy Davis, Gail Pilley-Harris, Jackie Fries and Sandy Berg were also present at the dinner. Also present were past local pastors including Rev Wong Kah Nguon and wife, Rev Dr Khoo Ho Peng and wife, Rev Dr Tie King Tai and wife, Rev Dr Lau Hui Ming and wife, Rev Hoo Sing Hang and wife, and Rev Tai Sing Leh. 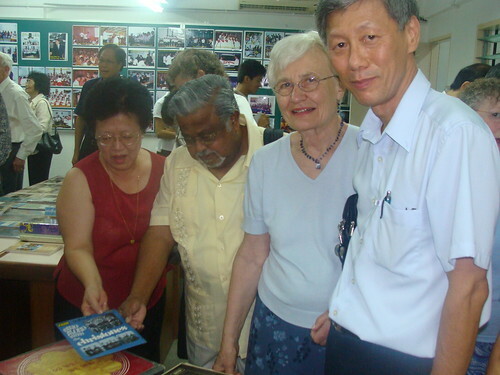 There were also a CD presentation each on the history of Wesley Methodist Church, and were entertained by individuals as well as by the Boys’ Brigade First Company Sibu band. The Golden Jubilee Celebrations in The Connection. 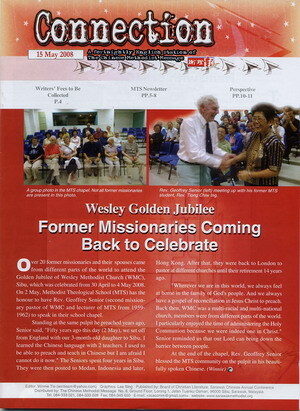 Over 20 former missionaries and their spouses came from different parts of the world to attend the Golden Jubilee of Wesley Methodist Church (WMC), Sibu, which was celebrated from 30 April to 4 May 2008. 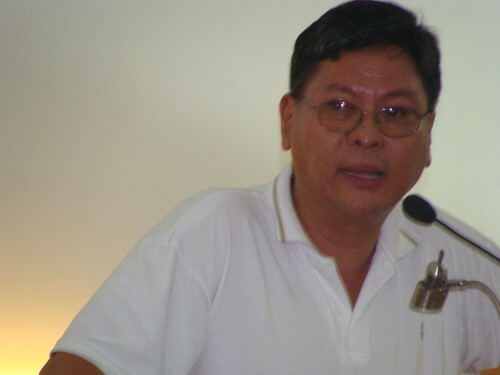 On 2 May, Methodist Theological School (MTS) has the honour to have Rev. 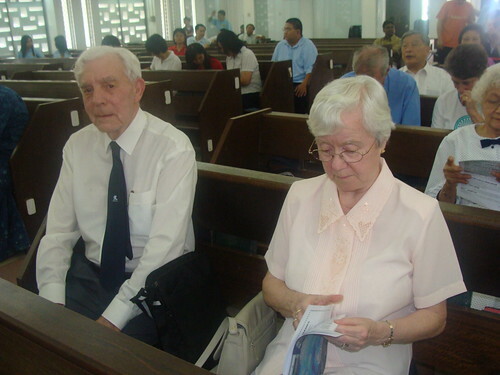 Geoffrey Senior (second missionary pastor of WMC and lecturer of MTS from 1959-1962) to speak in their school chapel. Standing at the same pulpit he preached years ago, Senior said, “Fifty years ago this day (2 May), we set off from England with our 3-month-old daughter to Sibu. I learned the Chinese language with 2 teachers. I used to be able to preach and teach in Chinese but I am afraid I cannot do it now.” The Seniors spent four years in Sibu. They were then posted to Medan, Indonesia and later, Hong Kong. 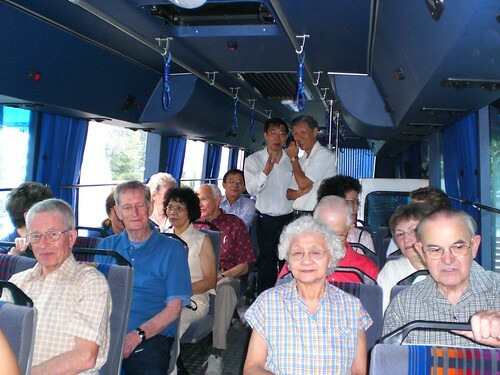 After that, they were back to London to pastor at different churches until their retirement 14 years ago. 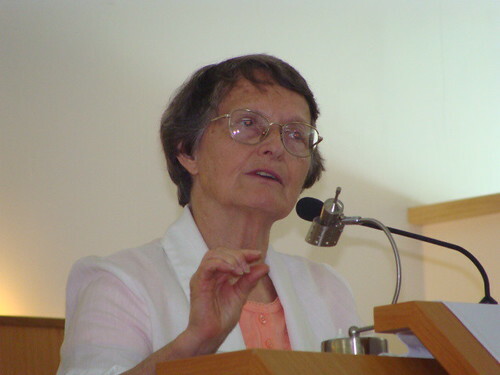 “Wherever we are in this world, we always feel at home in the family of God’s people. And we always have a gospel of reconciliation in Jesus Christ to preach. Back then, WMC was a multi-racial and multi-national church, members were from different parts of the world. 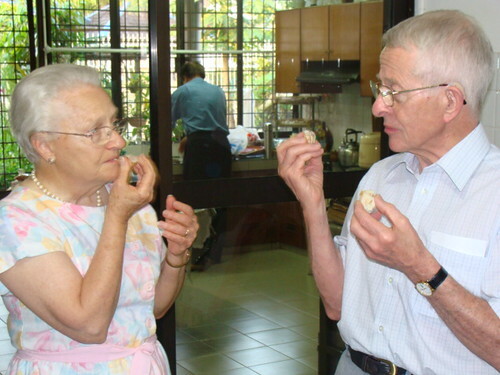 I particularly enjoyed the time of administering the Holy Communion because we were indeed one in Christ.” Senior reminded us that our Lord can bring down the barrier between people. Wesley Methodist Church, Sibu, came into being out of a need for Christian worship service conducted in the English Language. It officially began on 5 May 1958 when 19 Methodists and 9 Christians from other denominations under the leadership of a Methodist missionary, Rev. David Macdonald, met in the MTS Chapel to inaugurate a regular English worship service. Most of the worshippers were missionaries (and their families) who served in the local churches which used various local languages and dialects. They felt the need for fellowship and worship in their own language, and a Sunday school for their children. The Church grew steadily in importance and number under the capable and dedicated leadership of Rev. 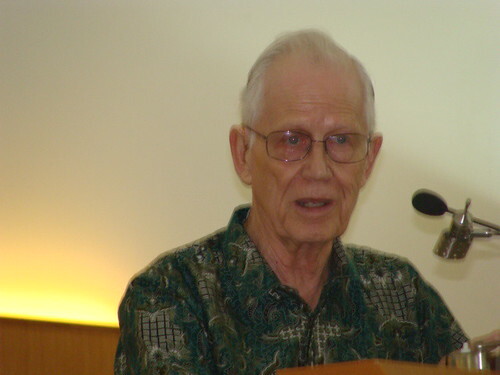 David Macdonald (1958-1959); Rev. Geoffrey Senior (1959-1962); Rev. 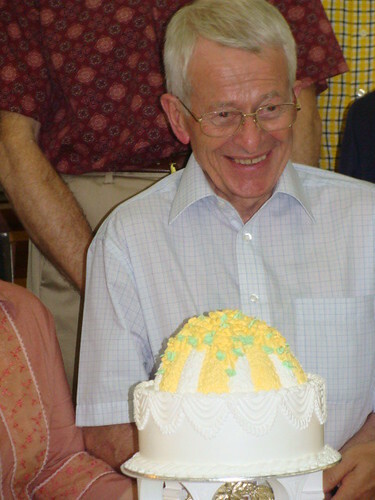 Roy Aylott (1963); Rev. Philip Williams (1962-1965); Rev. James Hipkins (1965-1967); Rev. 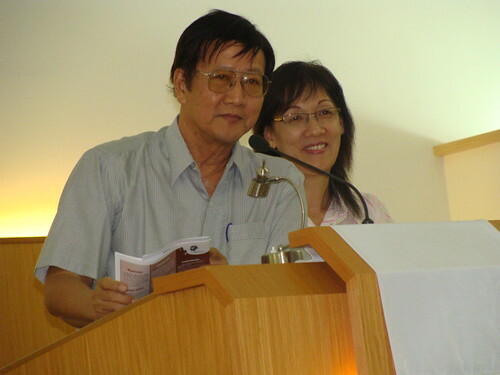 Chris Tomlinson (1967-1969); Rev David Chiew (1969). All those years, the serving pastors served only on a part-time basis and it was not until 1970 that Rev. 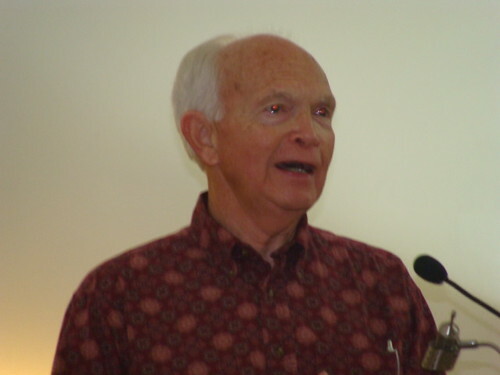 Jim Brinks was appointed the first full-time missionary pastor. More and more local residents joined as full members and regular worshippers as greater outreach was made. This period also saw the further reduction of foreign missionaries to Sarawak. It has been a week since we celebrated our Golden Jubilee, especially with the Thanksgiving Dinner on 3 May and the Thanksgiving Services on 4 May,2008, culminating in the opening of our Archives Center after the 5 pm service. Many of you have been so encouraging in giving very kind remarks regarding the efforts put in by the organizing committee. Quite a few have said, “You must be exhausted!” Remember my reply? What does that mean? What I meant was that I was truly exhausted and overwhelmed. There were indeed so many aspects to look into. But it’s been worth every ounce of my effort and the efforts of many others who had worked so hard to ensure the smooth preparation and running of all the events and programs. This includes those who worked tirelessly and quietly in arranging and providing transportation for our guests throughout the whole week. Thank you and thank you ALL again. Well, how do I feel now? —–Still getting over how amazing and wonderful it has been! God has been so good and gracious to us during the whole week, including the fine weather we had. The special feeling began when I first got to meet some of our former pastors and missionaries at the staircase of New Capitol restaurant on 29 April at 7 pm. One of the unforgettable remarks was when Sandy Davis gave me a hug and said “Do I know you before? I used to be Sandy McCaig.” Well, what can I say? The Sandy that I saw and remembered was 48 years ago. At the first instance some of them really looked like strangers to me. Wow, they were reconnecting, and for some, after almost 50 years. The REUNION had begun! Dear pastors and friends, in my welcoming remark I had hoped that your “Homecoming” would be a memorable one. Indeed it has been. We could all see and feel how much you all enjoyed the various places you visited, and the food you tasted, including durians (hopefully the taste and smell would last a would last a long time). Our apologies though for packing in such tight schedules, sometimes giving you enough time only to take a bath before the next event. Our excuse is, it’s Sibu hospitality! Much as you had been thrilled and blessed to see the progress of our church and SCAC as a whole, we have been the beneficiaries again. Your sharing especially during the Forum will long be remembered. Many Wesleyans who never knew you before shared how much they enjoyed and learned from the Forum and they understood the bonding. Even though the “boy with the missing shoe” stole the show, your group rendition of “And Are We Yet Still Alive!” was most touching. As for former Wesleyans who came from far and near, we treasure your presence. Thanks for taking time and making efforts to come. It was such a surprise to see Mrs. Teo. Besides those who came back from US, Australia and different parts of Sarawak, I also found out after dinner that Roselyn (Toh) came all the way from Dubai. Well, all good things must come to an end. To all Wesleyans at home, thank you one and all for your support and participation. Let us continue to be committed in our service to God through WMC. If and when we do go down the valley, let us be united and uphold one another so that we can climb the next mountain top together! into my mind which I remember singing when I was minister at Wesley 50 years ago. The words I believe were – Joyful, joyful we adore Thee and the tune was from Beethoven’s 9th Symphony ‘Ode to Joy’. I notice the tune is also in Mission Praise no 600. It seems to go well with the tune and I would very much like to dedicate to Wesley Church. Guiding us throughout our days. On the Cross – to save our race. Teaching us to know his will. Come on us like wind and fire. 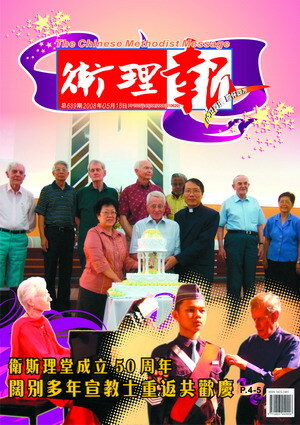 Wesley Methodist Church, Sibu, Sarawak has celebrated its Golden Jubilee Celebrations from 30th April to 4th May 2008. In giving thanks and glory to God, a series of meaningful program have been held. This site was set out before the celebrations which included welcome note, Wesley pastors over the past 50 years, and the celebration activities from 30th April to 4th May 2008. After the celebrations, the Organizing Committee shall post some of the activities, reflections and sharings.